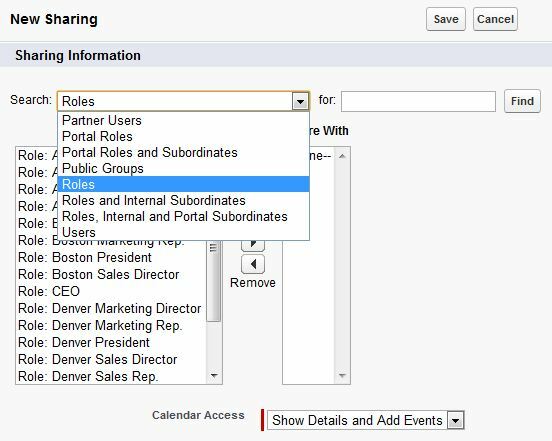 Why are we talking about Salesforce Calendar Sharing? As a Salesforce user, you have most likely had to ask a co-worker what their availability is on a given day. When trying to set up a meeting or event with multiple co-workers, you can spend half a day just coordinating the date and time. For an office administrator in a large company, this can become a full time job! Salesforce has thought of this and with Salesforce Calendar Sharing and the Salesforce Multi-user Calendar view, internal scheduling could not be easier. 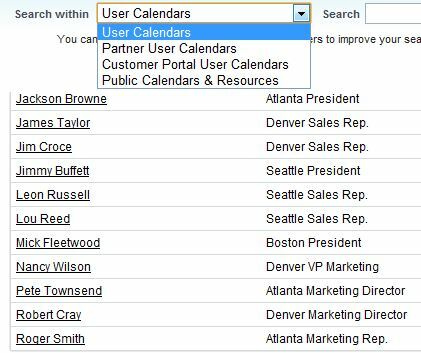 In the paragraphs and pictures below, we will show you how to grant expanded access to others in your company and how to use Salesforce to view another user’s calendar. 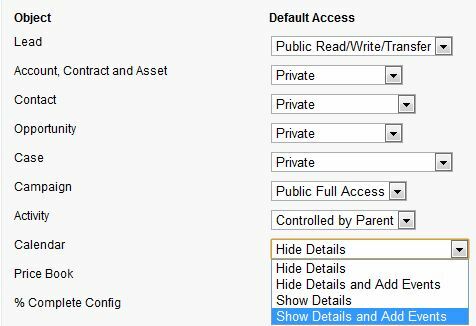 First off, your administrator will need to set the Salesforce “Organization-Wide Default” settings for Salesforce Calendar access. The default is usually “Hide Details and Add Events” but these may be changed to any of the values in the picture below. These set the base access level. 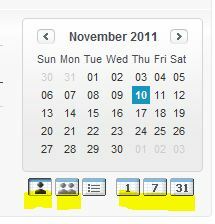 From your Salesforce home page, you can access your calendar from any of the buttons highlighted in the picture below. The single person button shows your calendar, the double person button shows multiple or all users and the numbers set the view as day, week, or month. Once in your Salesforce calendar view, you will notice the same buttons and two links in the top left as in the picture below. 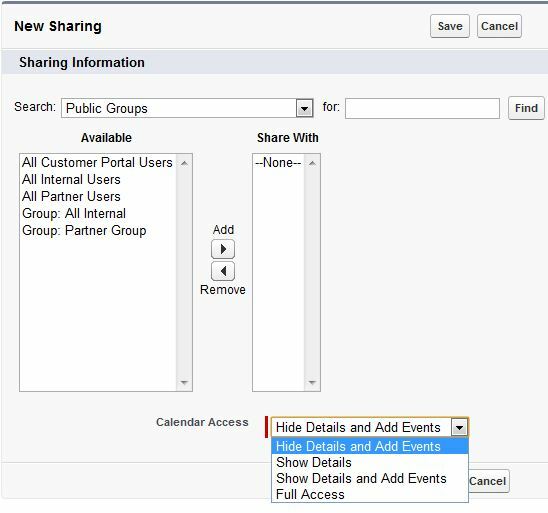 Clicking the “Share My Calendar” link brings you to your “Sharing Detail” page where you can see any sharing access you have granted (you are listed as the owner by default). Clicking the “Add” button brings you to the screen in the picture below where you can select individual users, personal or public groups, the users in a particular role, or the users in a particular role plus all of the users in roles below that role. Hide Details – Users can only see availability. Hide Details and Add Events – Users can see availability and add events. Show Details – Users can view the details of events, but they cannot add events or edit existing events. Show Details and Add Events – Users can view the details of events and add events, but they cannot edit existing events. Full Access – Users can view the details of events, add events, and edit existing events. You can create a different sharing line item with different access for multiple users, groups, etc. You may want your secretary or assistant to have full access but you may only want to show details to your co-worker. Be sure to save when done. This allows you to view other user’s Salesforce calendars that you have access to. In the picture below, you can see the different choices you may have. Select a user and you now see their Salesforce calendar instead of yours. Notice that the “Share My Calendar” button changes to “Back to My Calendar” (as in the picture below) when viewing another calendar. You can also use the “Change” link again to view a different calendar. As you can see, Salesforce Calendar Sharing can greatly increase your productivity. 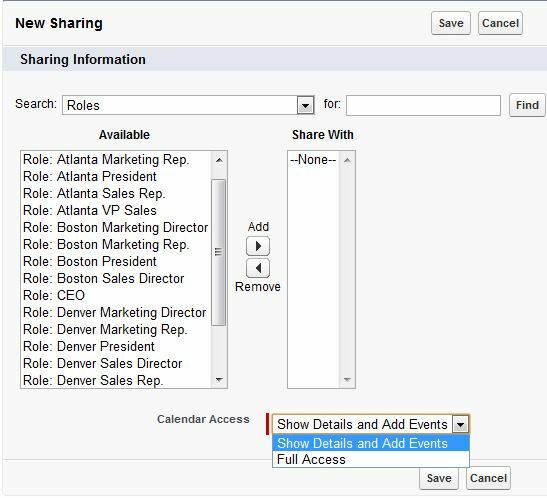 At a glance, you can see the availability of your co-workers using Salesforce calendar sharing.